The professionals at All American Carpet & Tile can steam clean tile and grout; polish, clean, and seal stone floors; clean and refinish wood floors; provide emergency flood water extraction and restoration; and mold remediation services. Most recently in 2011, we opened a full service rug washing plant in Pacific Beach. 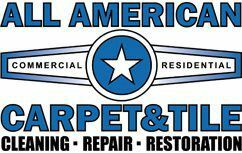 All American Carpet & Tile is a certified firm with the Institute of Cleaning and Restoration Certification or IICRC, a Green Seal provider, a member of the Carpet & Rug Institute (CRI), Carpet & Fabric Institute (CFI), and the Better Business Bureau (BBB) with an A+ rating. Follow us on social media for all our recent updates!